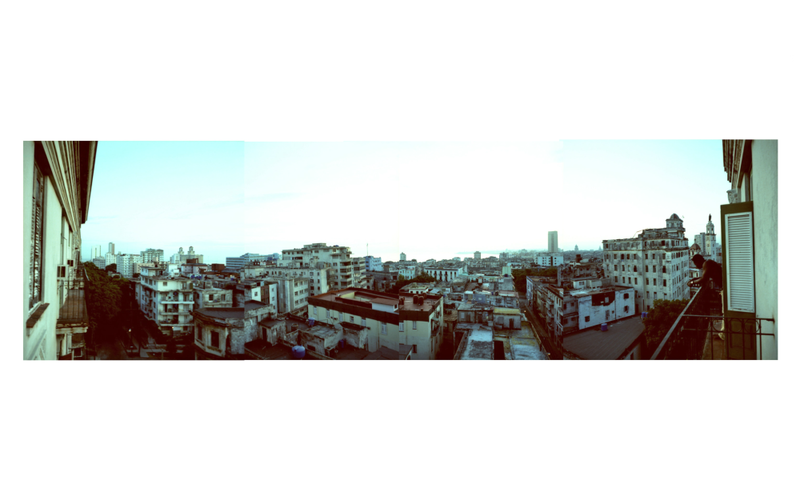 I went to Havana for a few days last summer, and for that trip I came up with the idea of creating panoramas from 6x6 negatives by overlaying the edges of the individual pictures. I like the imperfect joining. 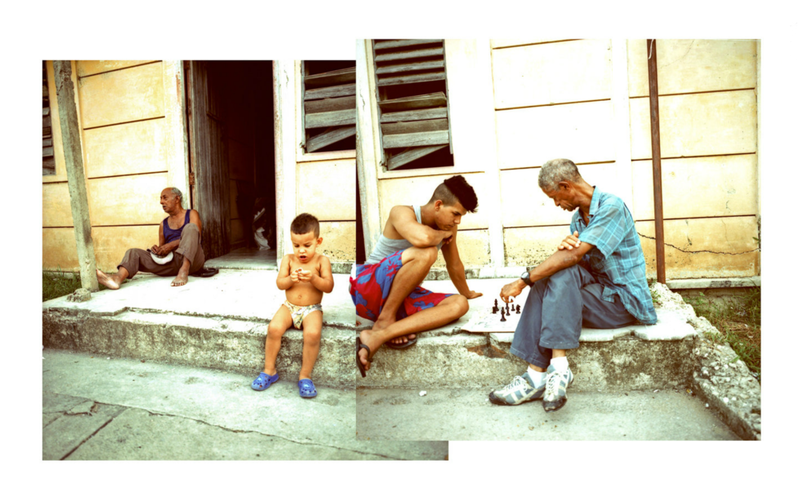 I think it fits the rough edges of Havana and the distortion the montages sometimes produce help to put across the disorienting, sometimes surreal experience of being in the parallel universe of Cuba. Not simply a society frozen in the past; it’s simultaneously a society that has been striving toward a particular kind of future. I use cross-processed Ektachrome -- like most of the cars there, highly valued (by me anyway) and no longer made -- to try to evoke a color palette from a different time. For this most recent trip in June, I wanted to include portraits, something very easy to do and so have a number of more intimate two-image montages. Cubans are the most outgoing, talkative people I have ever met, and they seem particularly interested in talking to an American. It’s a place with a tangled history when it comes to Americans, as I was reminded by passing San Juan Hill on the road from Santiago to Playa Siboney and a little while later, passing by the little house from which Castro and a hundred others launched the revolution in 1953 with their ill-fated raid on the army barracks in Santiago. Now with that history taking a turn, I want to understand and portray the present. In Santa Clara, a small tranquil city in central Cuba, I walked out from the relatively prosperous center to the other side of the river to the dusty streets of a poor neighborhood where I found the old man and young man playing chess (at the same time, there was a huge chess tournament attracting players from all over Latin America in the cultural center off the town square). Next door to them was a woman who started up a conversation with me and while we were talking, her neighbor’s 4 year-old daughter who she was watching ran out of the house to greet and climb aboard a little “train” with a smiley-faced engine and a couple carloads of gleeful little kids. It was like something out of Disneyland without the Disneyland. I hope I’m not selfish in hoping that, along with Cubans’ economic conditions improving, increased connection to the outside world and freedom to communicate and travel, that some things aren’t lost. I hope my pictures don’t romanticize and don’t come across as sentimental. That’s not what I intend. I heard enough stories of the difficulties of people’s lives to avoid those feelings. What I learned is to respect the Cuban people and respect what they have built and what they value, which takes time and personal interaction to understand. I hope it’s that respect that comes through.